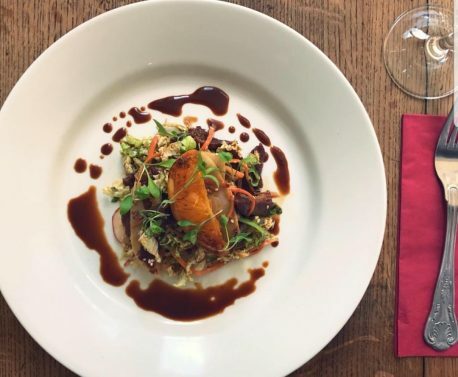 Manchester Wire exclusive offer: 50% off food at The Rivals in August. We reviewed the Royal Exchange’s restaurant and bar back in May (click here for more) and fell in love with the gourmet pub menu and exceptional wine list. The brainchild of Jamie and Goska Langrish (Hawksmoor, The Parlour), restaurateur and actor, Rupert Hill, and former Gray’s Larder chef, Anna Fysh, The Rivals is a really special pub and restaurant, tucked into it’s own wood-panelled enclave in the Royal Exchange building. With no theatre show on for the next four weeks, The Rivals is only open at lunchtime during August – and they’re offering Manchester Wire readers an exclusive deal of 50% off all food between noon and 4pm (T&Cs below). The menu includes salads (new season asparagus, crispy duck egg and Chistorra sausage or crispy duck, now under £4), and small plates (feta arancini with artichoke; cauliflower dhal and pickles , now £3), while mains include crispy pork belly, buttery mash, black pudding, kale and apple, a herb crusted cod loin with brown crab beignet, samphire, potatoes and lemon puree (our favourite dish in Manchester right now). Meat includes beer braised beef with onion confit, gremolata polenta chips, tandoori salmon or rump of lamb with oregano roast potatoes and salsa verde (all under £10.50 with our offer). Vegetarian options include courgette and goats cheese fritters with padron peppers and baked squash falafel with sumac roast squash. Freshly baked focaccia pizzas (Parma ham, spicy Nduja, mozzarella and so on) are now £3 or less and bar snacks are part of the deal. Tuck into fritters (masala chickpea with homemade mango chutney or pea with salsa verde) and comfort food such as deep-fried battered cod cheeks, salt and vinegar wedges with bloody Mary ketchup or polenta chips and finish things off with a double-portion cheese board for £6, and puddings such as chocolate delice with peanut ice cream, secret recipe sticky toffee pudding, rhubarb and custard sponge with ginger custard for less than £4. The deal is 50% off food noon-4pm up to and including 31 August 2018. To take up this offer, diners must call 0161 615 6666 to book quoting ‘50% Manchester Wire’.